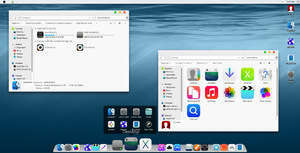 iOS Skin Pack is a set of theme modifications for Windows 7 which changes the look and feel of your Windows PC into something similar to Apple devices running iOS. The transformation here is purely cosmetic and the actual back end operation of your PC should remain unchanged. Some of the changes that iOS Skin Pack makes include modification of the Start Menu icons to resemble those on a Mac system, windows will change their looks and the wallpaper and boot screen will also see some changes. It also alters the buttons which maximize, minimize and close windows. Version 6.0 (26.12.2018) is a freeware program which does not have restrictions and it's free so it doesn't cost anything. For security reasons, you should also check out the iOS Skin Pack download at LO4D.com which includes virus and malware tests. Additional screenshots of this application download may be available, too. 4 out of 5 based on 69 ratings.